If you’re an ActiveCampaign user, or looking to evaluate the ActiveCampaign platform, here’s some exciting news. 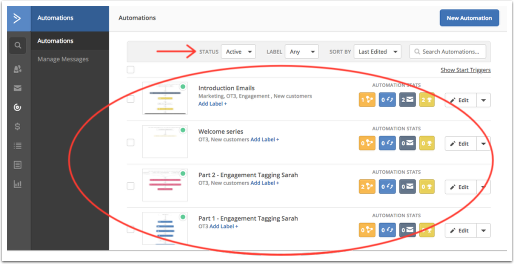 In the past couple of months, the marketing automation platform has rolled out new features designed to make ActiveCampaign easier to use. Whether you’re new to ActiveCampaign or you’ve been using the platform for years, I recommend you take a few minutes to get familiar with the new features. The old ActiveCampaign navigation layout. In the old version, the primary navigation bar was at the top of the screen (red horizontal box above), with app features contained in dropdown submenus (red vertical box above). The design was straightforward enough, but according to ActiveCampaign, it was difficult to find and access certain features. 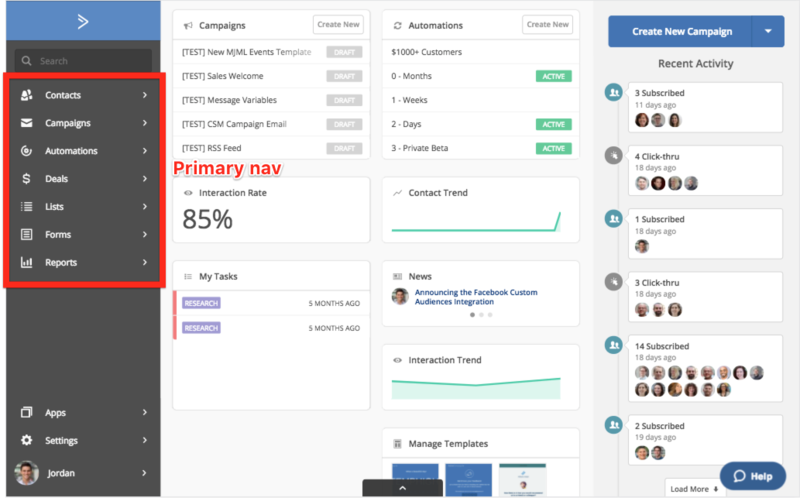 In an effort to create a better user experience, ActiveCampaign has released a new interface. As of now, the new navigation is still optional, and ActiveCampaign has no set timeline for making it mandatory. But they’ve made clear that going forward, new features will only be added to this new version of the navigation. Overall, I like the change and think it succeeds in making ActiveCampaign easier to navigate. If you’re using the old nav layout, I recommend at least giving the new version a try. I think you’ll find it more efficient and intuitive. The next big change has to do with the Automations Overview page. If you’re an ActiveCampaign user, you’re no doubt familiar with Automations Overview – it’s where you go to access automations, one of the key features of ActiveCampaign. In the old version of Automations Overview, the ability to sort automations was pretty limited. But with the new automations overview, you have multiple ways to organize them. I think this is especially handy, because once you’ve set up several automations in ActiveCampaign, you want to be able to quickly find and access them. You can now sort your ActiveCampaign automations by label. Labels are great if you have several pages of campaigns you’re trying to keep organized. For example, if you’re an agency working with multiple clients, using shorthand labels can make navigating a lot easier. 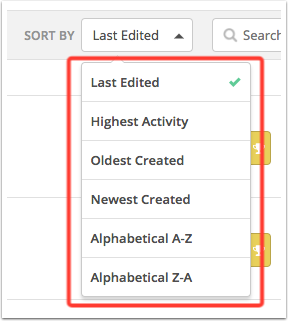 Sorting automations drop down menu. 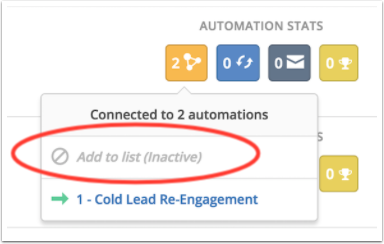 In addition to the new drop-down menus, the Automations Overview now displays important information about your ActiveCampaign email automations. 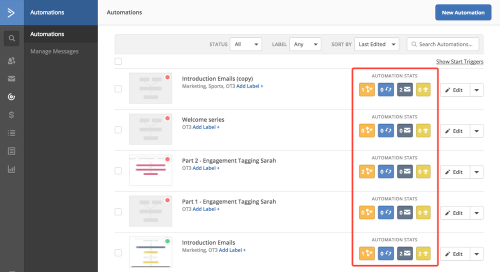 Automation details connected, contacts and campaigns. 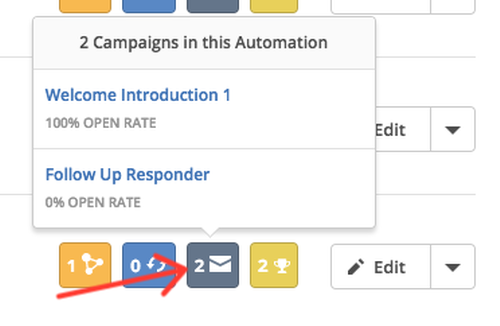 By clicking on individual campaigns, you can go directly to that campaign report. 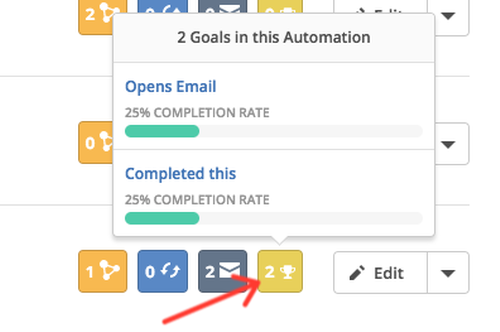 Similarly, hovering over the automation goal icon (the gold icon with a white trophy) shows you the name of each goal and its completion rate. Clicking on a specific goal takes you to its report. 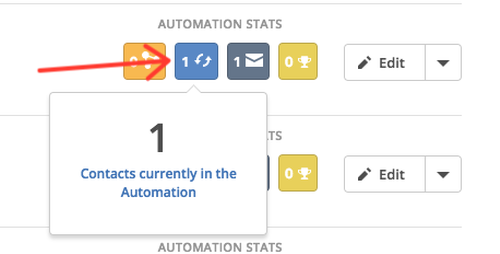 Another nice addition is the ability to view the start triggers for your automations in the overview page. You can simply click “Show Start Triggers” in the upper right hand corner (underneath the search bar) and the start triggers are displayed. The shortcuts are now live for all ActiveCampaign accounts, and they make using the Automations Overview page quite a bit more efficient, once you get used to it. And if you want more information about organizing your automations in ActiveCampaign, click here. And finally, ActiveCampaign has changed the way to manage permissions within automations. Before the change, permissions were all or nothing: you could either edit all automations in your account, or you could edit none. Now, admins can grant permissions on a per-automation basis. So if a user needs to make changes to a single automation, the admin can grant permission to that one campaign, while restricting access to others. This gives admins more control over who can do what in their ActiveCampaign account. If you manage your company’s ActiveCampaign account, it will be a relief to know not everybody can access all the accounts. This new permissions feature is currently live. What do you think about the new features? Are you an AC user, or considering trying out the platform? Let me know in the comments below. 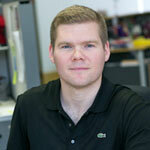 About the author: Brad Wages is a conversion copywriter and email marketing specialist. He helps SaaS and tech businesses acquire and activate more users with persuasive messaging. You can connect with him on LinkedIn.